These are the secrets about grocery stores and shopping in them that you will also discover if you bring your children with you! If you want it to storm you need to plan the day before to go grocery shopping. It is like washing the car! You will be sure to get drenched and all of the wonderful food you have purchased will also be dripping as you bring it in the house! Grocery stores are haunted! The sweetest little children at home and who all excited to go "help" mom, dramatically transform in the store! I have seen this transformation as we walk past the gumball machines! Some entity must take over their little minds and bodies and turn them into raving crazy things! Often we aren't even in the actual store yet and already I feel like turning on my heel and heading out the door! This haunting also causes the children to develop the loudest screaming voice known to man. Outside of the grocery store you may have never heard this voice before, but EVERYONE in the store will hear it! In addition to the raving crazy thing and screech owl you now have in your cart, suddenly the children become superb debaters! They can argue any point about nutrition and how I am the meanest mom in the world in one breath! It may not make sense to the average adult, but it is truth! This debate may continue throughout the entire trip with bits of repetition throughout. "Mom, can I have that?" "But I want that! Can we have it puuullllezzzz???" "NO! Don't ask again! I am not changing my mind!" 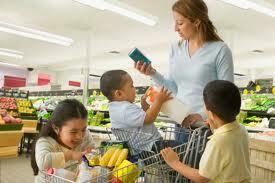 Every person in the grocery store is really there to analyze you as a parent. If your baby does not have shoes on in the winter a "parenting expert" (most likely the one who is 80 and has never had children) will approach you and either tell you that the baby needs shoes or it will die or will make a comment to the baby like, "You poor thing! Your feet must really be cold! I hope you don't get pneumonia!" Your children will be on their worst behavior, you will look like you just woke up and have peanut butter on your face from breakfast and you will run into either a person you went to high school with and haven't seen in 10 years or an ex-boyfriend. You will not be able to hide. They will track you down and delight (on the inside) in your misfortune! How it is they recognize you in this state is nothing less of a miracle! You will become extremely hungry and thirsty while shopping! Things you do not need and do not like will actually look delicious and you won't be able to leave the store without them! Be warned! You will not like that boxed meal just because you are hungry now! Your cart will start out nice and neat and end up with things piled high and squished! Then when you get to the checkout, you will pick the slowest lane with the cashier who wants to tell you their life story. This is especially true if you are in a hurry! In addition, there is no easy or right way to load the conveyor belt! Your bread will most likely get squished because the kids take up the only safe seat! The truth of the matter is, if you can go grocery shopping by yourself it can be a very calm enjoyable experience. Most likely the only one I will have all day. During which you can have a few adult conversations over the produce selections and at the checkout. You may not even mind hearing about your cashiers skin conditions! Go shopping without the children! It is still a haunted place, but it will be less stressful in the long run! I know you all have awesome stories about grocery shopping! What are they? Share in the comment section on this page so I know I am not the only one! !